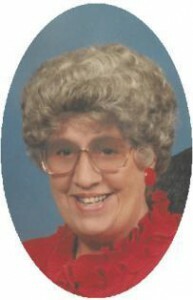 Jane M. Roepke, 83, of N Webster Street, died Saturday, July 30, 2005 at her home after battling cancer. She was born in Milwaukee, Wisconsin to Martin and Agatha Laubach Inkmann on March 28, 1922. After graduating from Messmer High School in Milwaukee she worked at Northwestern Mutual Life Insurance Company in Milwaukee. During World War Two Jane and her twin June volunteered at the USO shows in Milwaukee. On July 6, 1946 she married Milton Roepke in a double ceremony with her sister June at St. Michael’s Church in Milwaukee, Wisconsin. In the early 1950’s they moved to Port Washington when Milt took a job at the Electric Company. Jane worked in Admissions at the former St. Alphonsus Hospital. Later she was secretary for Mr. Bert Smith at the former Smith Bros. Smokehouse in Port Washington through the 1980’s. She was active at St. Peter of Alcantara Catholic Church singing in the choir, teaching CRE for many years, helping in the St. Ben’s Food Program and even serving as a parish council member. Jane is survived by her husband Milton, daughter Julie Roepke and granddaughter Ashley Kidd, all of Port Washington. She is further survived by sister Lee (Rocco) DeFilippis, brother-in-law Paul Kloss, both of Port Washington, other relatives and friends. Her sister June Kloss and brother Martin Inkmann preceded her in death. The Rev. Allan Sommer will celebrate Mass 6 pm Wednesday, August 3, 2005 at St. Mary’s Catholic Church, 430 N Johnson Street, Port Washington. Entombment parish cemetery. Visitation from 4 – 6 PM Wednesday AT CHURCH with a 4 PM rosary service.